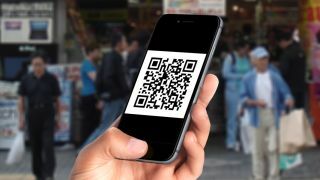 QR codes can be used for a lot of things - website links, coupons, tickets, and contact information, just to name a few - and scanning them using your iPhone or iPad couldn't be easier. Apple has built QR Code recognition directly into its camera app, which means all you need to do is open it up and point it at the code in question. You'll get a notification appear on screen once your iOS device recognizes what it's looking at (which generally takes less than a couple of seconds), promoting you to action the link the QR code points to - a quick tap on this and you'll be taken to the desired location, usually within the Safari web browser. This works on all iPhone and iPad devices running iOS 11, and we fully expect Apple to retain the QR code scanning feature in iOS 12, which will be available later this year. Step four: Tap the notification to be taken to the destination of the QR code. There's also a built-in QR reader in the Wallet app on iPhone and iPod. To access the scanner, open the app, click on the plus button at the top of the "Passes" section, then tap on Scan Code to Add a Pass. From here, you can scan QR codes for coupons, boarding passes, tickets, and loyalty cards, but only for the specific things that Wallet considers "passes." If you try to scan any other QR code, you'll get an error message. If you don't fancy either of the above two methods, you can also head to the App Store where you'll find a wide selection of free QR code reading applications. Check out our iPhone X review video below.